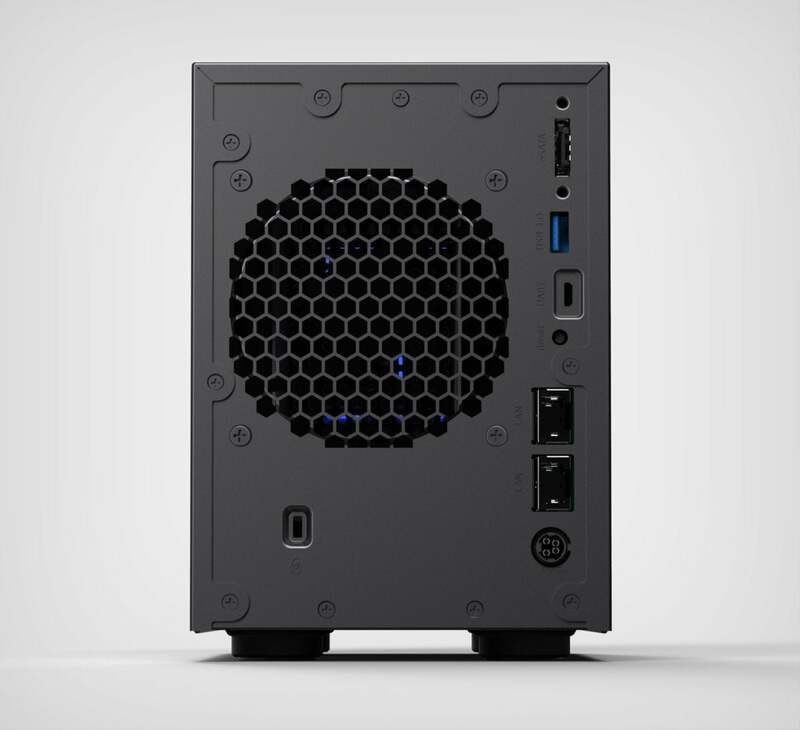 It's one of the more expensive NAS boxes you'll encounter, but it's also extremely capable. Netgear makes well-built, super-fast NAS boxes that we truly enjoy testing. The ReadyNAS RN422 might seem expensive—you can buy one at Amazon, without drives, for $360—but they’re actually quite affordable compared to similar business-grade products from QNAP and Synology. While aimed at the enterprise, this class of hardware is outstanding for media streaming and backup on a home network. The only downside is the occasional need for above-average tech chops for things like setting up a website server or FTP backup. If that doesn’t faze you, then the RN422 (or any of its siblings: the RN424, RN426, or RN428, offering four, six, and eight drive bays respectively) will serve you well. Pun intended. The RN422 is a two-bay box with a front-panel LCD and five modern-looking, blue-backlit buttons that you can use to view the box’s status and perform simple functions. Flip that part of the box to the side and you have access to the easy-change drive bays. Below the swing panel and drive bays is a single USB 3.0 port. The back of the RN422 is home to a pair of gigabit ethernet ports, a second USB 3.0 port, an eSATA port, the power jack, and a Kensington lock port. The chassis and shell are largely black and of mostly metal construction. The RN422 is hefty enough to stay where it’s put, even if you install lightweight SSDs. The same can’t be said for NAS boxes largely made of plastic. 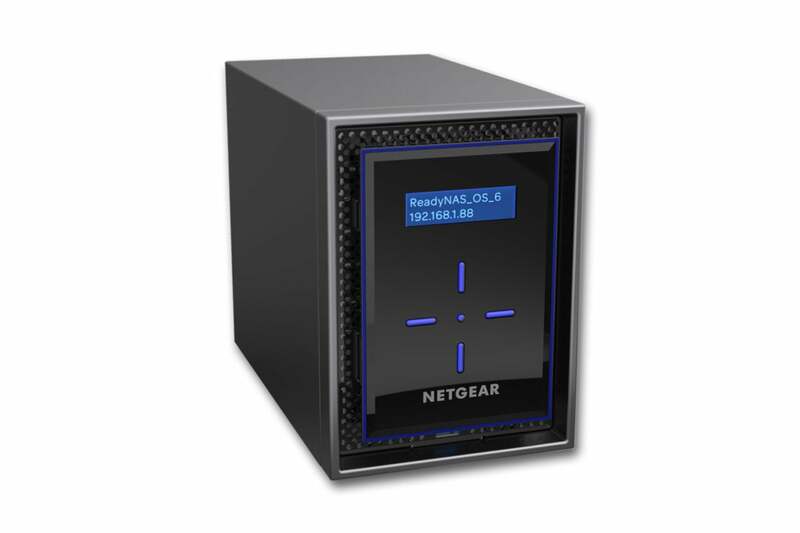 With dual gigabit ethernet ports—whether used for for doubling throughput or failover protection—the RN422 is as fast and as reliable as they come. The two bays feature trays with plastic screw-replacing inserts for hard drive installation. It’s easy, at least once you spot the diagram on the tray that shows you how to work them: Slide up the same tab that releases the tray from the bay and the insert will slide out about 4 inches, so you can bend out the sides and slide in the hard drive. Press in the second slide-stop where it catches on a hole to completely remove the insert for SSD installation, which does require screws. Netgear recommends setting up the RN422 via the ReadyCloud.Netgear.com web portal; however, we wanted to take the front panel for a spin. Installing an SSD that was already formatted, stopped the box with the error: “Used disks, check RAIDar.” That’s fine, as it could save you from accidentally overwriting important data, but the front panel doesn’t take you any any further. That’s a bit of a tease for IT types who might like to administer the box from the front panel. The web portal didn’t work for us either for some reason, so we downloaded Netgear’s RAIDar utility, which found the box and allowed us to reformat the drive. Alternatives are a good thing. And if the web portal works for you—even better. Though you may need to spend some time with the user’s guide, you’ll be glad you did. There’s not much that the RN422 isn’t capable of. Once up and running, we were impressed with ReadyNAS OS 6.8. It’s improved since our look at version 6.6 on the RN212, and there are quite a few apps available, including BitTorrent, Drupal, and an iDrive client. Our only major wish is for an email server, but that’s a small-business thing that will affect few users. Speaking of business, it would be nice if setting up a website server was little less convoluted. For multimedia purposes, there are both iTunes and DLNA media servers, as well as Nero MediaHome, the ReadyNAS Photo server, and the DVBLink TV server for attached USB TV tuners. There’s no version of the increasingly popular Plex Media Server available, though we’re fans of the more transparent, non-proprietary DLNA. Also on hand is Milestone Arcus Surveillance with two camera licenses, so you can cover the front yard as well as the back. Additional licenses are available at $60 each, 4 for $200, or 8 for $360. That's not cheap, but it's pretty much par for the course (for business-class NVR—network video recording—that is). Most users should be able to cope with only the two free licenses. 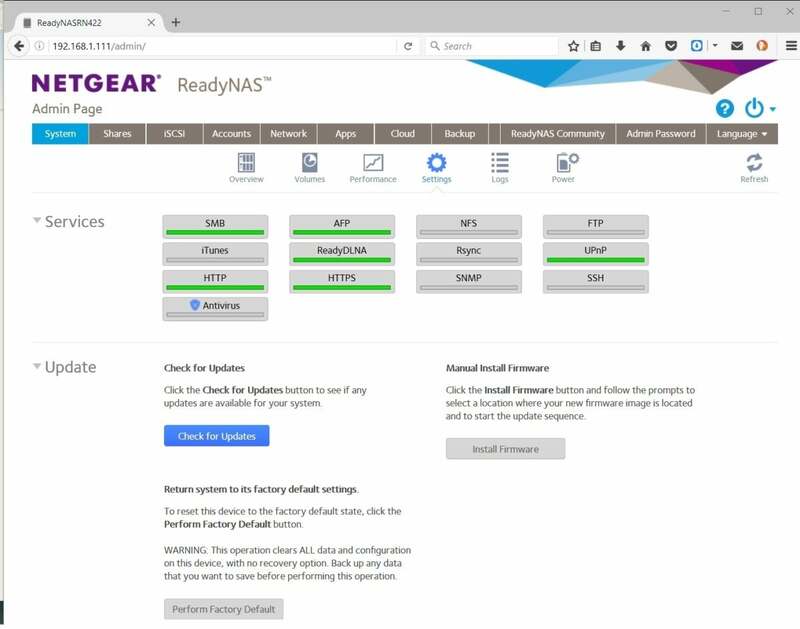 The ReadyNAS OS has great integrated backup capabilities, including remote replication (mirroring to another box or location, including cloud-storage services such as Amazon Cloud Drive, Dropbox, and Google Drive) and the ability to back up to and from remote locations using FTP and Rsync. Read our treatise on backing up your network PCs without the use of client software here. We still have the same gripe about FTP as we did with the RN212: You can’t browse the remote site; instead, you must manually enter the path of the remote shared folder. Here’s hoping you wrote it down. But that’s hardly a deal-killer, and most users will probably opt for the ReadyCloud backup clients that are available for major operating systems and mobile devices. Clients are the easier, albeit less transparent way to keep your PCs and devices backed up to the RN422. As we mentioned up front, Netgear boxes are usually very fast. Using a dual-core, 1.5GHz Intel Atom Processor C3338 CPU and 2GB of memory, and running the BTRFS (B-TRee File System, often called the “Better” or “Butter” FS), the RN422 clocked 108MBps writing and 103MBps reading large files in CrystalDiskMark. That’s actually a bit slower than the RN212 we reviewed earlier this year, but where the RN422 really took off was with queued reads and writes: It absolutely blew away every other box we’ve tested to date. That’s particularly meaningful considering that’s the way data is generally served up these days. The Netgear RN422 really shines when it comes to queued writes. All numbers indicate MBps. In our own real-world 20GB large-file copy tests, the RN422 read dead steady at 111MBps and wrote at 114MBps. With our 20GB mix of smaller files and folders, it managed 87MBps reading and 77MBps writing. Those are very good numbers. Subjectively, the RN422 was a joy to use. The configuration pages popped up quickly and we didn’t spend a lot of time waiting for folders to open or for the box to appear. The streaming performance was exceptional, with five devices streaming 720p video from the RN422 simultaneously with ease. 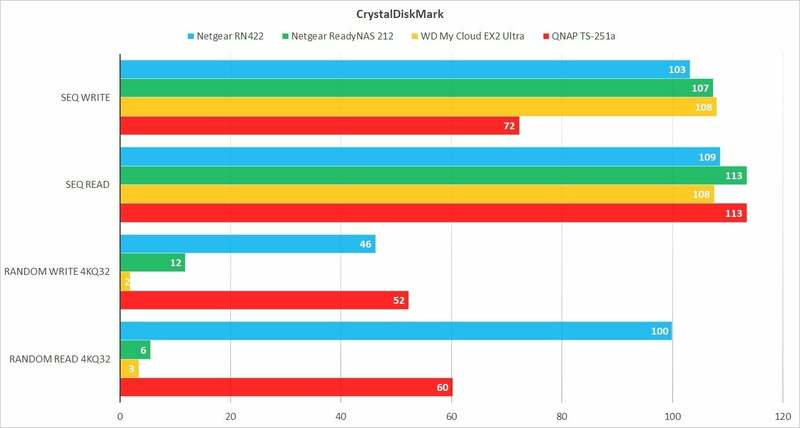 The average user might be better off with a cheaper, easier WD My Cloud (avoid the newer and dead-slow WD My Cloud Home) or Seagate Personal Cloud. But if you’re looking for something faster, even more reliable, and that has the exoskeleton to withstand major abuse, the RN422 is a great product. To be honest, we’d keep it plugged into the network in lieu of a lot of other boxes—including those we just mentioned—simply because of BTRFS and its performance. We're big fans of this box's all-metal construction and world-class performance. We also like its user interface, although it could be easier to use, and we wish it could be administered fully using its front-panel controls, but this is a great product overall.